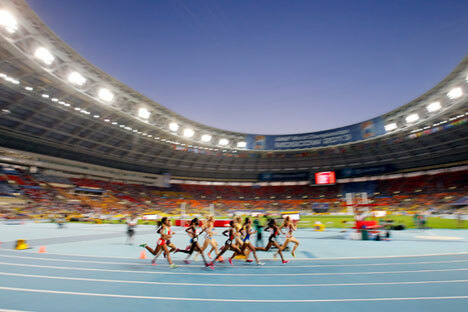 Runners competing in the women's 1500m final at the 14th IAAF World Championships at Luzhniki stadium in Moscow, Russia. The accusations of Russian track and field athletes having used banned performance-enhancing drugs naturally provoked a heavy reaction in the Russian blogosphere. Although some people see a political subtext to the scandal, others find the claims of the World Anti-Doping Agency’s report fully justified. Russian bloggers reacted quickly to the World Anti-Doping Agency's demands to disqualify the Russian Track and Field Federation from the International Association of Athletics Federations (IAAF) on Nov. 9, following the publication of a report accusing Russia of systematic violations related to athletes' use of illegal performance-enhancing drugs. Some people believe that there is an obvious political subtext to the scandal, which Russian Sports Minister Vitaly Mutko has said could result in Russian athletes being banned from participating in the 2016 Olympics in Rio de Janeiro. LiveJournal user nyka_huldra thinks WADA is trying to "pressure the Russians" and drive them behind "the iron curtain." "An investigation? Nonsense! International sports officials not only compiled a list of Russian track and field athletes who should be permanently disqualified, which has already happened, but also for the first time recommended banning our athletes from all competitions held under the aegis of the IAAF. Moreover, it is said that Russia has created a doping indulgence system," wrote nyka_huldra, seeing a political interpretation to the sports problem. The blogger also recognized that "there have been doping cases in Russia" but claimed that "this has not occured any more than in America." "The present case says that passions in the anti-Russian war are growing. But the fact that sports officials have become a part of it is doubly disappointing," wrote nyka_huldra. In the opinion of Facebook user El Murida, "it seems that this is an instance of a ‘shot across the bows’ before the main event – the canceling of the Football World Cup in Russia, which will be presented to Putin in 2018 as a ‘gift.’"
Once-popular Russian politician Ilya Konstantinov, who appears on LiveJournal as ivkonstant, readily acknowledges that Russian athletes used drugs. "…What I can't acknowledge is that in some sunny Colombia or Somalia there are different morals. They don’t have nuclear weapons. But this is a question of time. However, they are not being banned from international competitions," he wrote. Konstantinov perceives in this a desire by Russia to isolate itself, which is actually advantageous for domestic Russian proponents of the theory that Russia is a besieged fortress. At the same time, a significant part of the Russian blogosphere believes that the accusations are justified. LiveJournal user ni_usa wrote that "there are no politics here. Olympic values certainly forbid doping. That is why athletes' biological samples are stored for many years and are repeatedly analyzed, each time with more advanced methods." "I never doubted the mass doping in Russian sport. I just couldn't understand why they were not caught on a mass scale. I guess they started catching them when the management changed. During the last Track and Field World Championship entire types of Russian sports were not even represented," wrote Google+ user Vitalii Fersanov. Livejournal blogger Murarius, meanwhile, thinks that Russian officials were unprepared for such a step. "Mutko [Russian Sports Minister Vitaly – RBTH] took a break with the usual 'We have nothing to do with it, you are to blame,' while everyone is involved in a feverish search for the 'right disclaimer.' Because the disqualification of all the country's track and field athletes from the Olympics is no laughing matter."